We develop relationships with the top land developers in the area to ensure we secure some of the most ideal locations available. 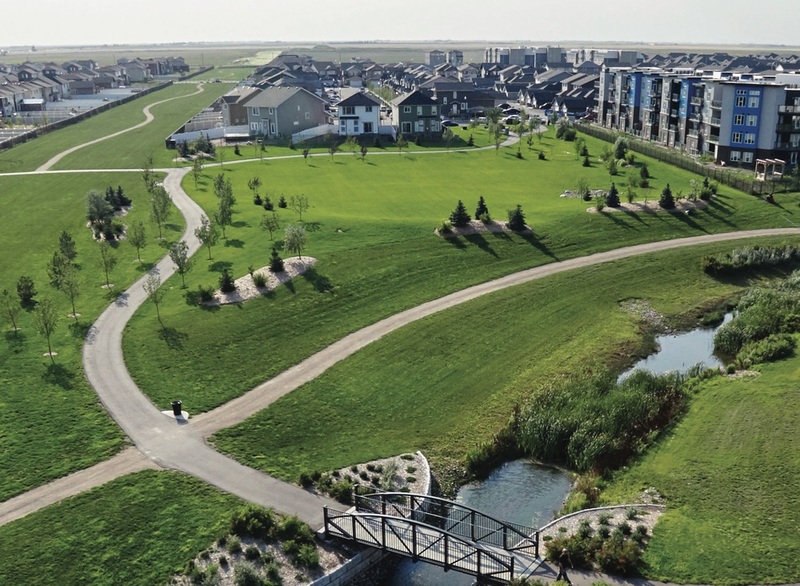 The Greens on Gardiner, located in southeast Regina, features quality homes built to high energy conservation standards, in a “greener” residential development. Several prestige lots will permit home designs with lower level walkouts and exceptional views. Stay active walking, jogging or bicycling on an extensive system of neighbourhood walking paths and park area—over 40 acres of green space plus environmental reserve. A big part of Trademark Homes history is developing homes in existing neighborhoods. We are able to teardown existing homes, service and zone land on your behalf to accommodate most any project or home that you may have in mind. We have some land options already for you, but also can work on your existing lot and location. Westerra is a new 490 acre Complete Community offering a wide variety of single family and multifamily homes. Westerra features neighbourhood parks and pathways, a retail shopping district, boutique shops on West Market Street and a business park with convenient access to employment opportunities. Smart Growth is an urban planning theory that focuses growth in compact, walkable, urban centres to avoid sprawl. Smart Growth advocates transit oriented land use, neighbourhood schools, complete streets and mixed use development. Located in the small town of Pilot Butte, just 11 minutes east of Regina, you will find Discovery Ridge. This community offers homeowners choice and diversity by offering different types of lot design and landscaping features. Life in Discovery Ridge will never be boring and if you have an active lifestyle you will love the nearby ball diamonds, neighbourhood walking paths, tobogganing hill, and local skating rink. Pilot Butte has a local elementary School (K- grade 8). The feel of a small town just 10 minutes outside the city! The town of White City strives to maintain a safe, friendly and affordable environment for all to enjoy. This town is perfect for those looking to escape the hustle and bustle of the city and enjoy life at a slower pace. The community of White City has many amenities including a pre-school, an elementary school (K- Grade 8) offering both English and French Immersion programs, doctors offices, a pharmacy, grocery centres and much more. 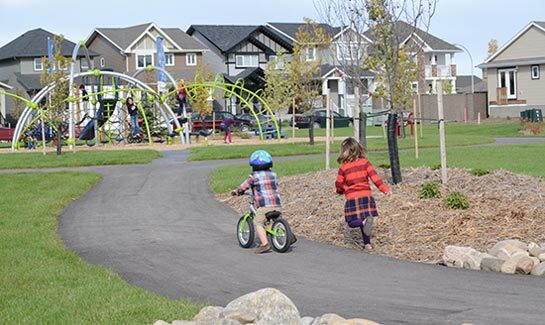 Located in Regina's North West corner, Fairways West is the ideal neighbourhood for families and all those who enjoy nature. This safe and relaxed community is situated near environmental reserve areas and backs the Joanne Goulet golf course, as well as the picturesque Wascana Creek. With professionally designed streetscapes and numerous well-maintained green spaces, Fairways West is the kind of neighbourhood you'll be proud to call home. Fairways West is just minutes from downtown Regina and mere blocks from many great shopping, dining and entertainment destinations. The City of Regina’s newest residential community development is The Towns. The Towns is located in the very desirable east side of the city near two of Regina’s newer subdivisions: The Greens and The Creeks. It has a broad mix of uses that work for all stages and styles of life. The Towns will offer choices of housing, open green space and connectivity within the community, creating a flexible neighbourhood for all to enjoy! Edgewater is located on the west edge of Regina next to Wascana Creek and the Joanne Goulet Golf Course. A quick commute to downtown Regina, retail shops and grocery stores – Edgewater is the ideal place for both first time and move up buyers to call home. In Edgewater, the views are bigger than the mortgages, which means finding your dream home doesn’t mean sacrificing your dream lifestyle. It’s time to bring back the excitement of buying a home. Time to start paying attention to real needs. Time to recognize today’s new, intelligent buyer. Hawkstone will define a new level in affordable, convenient and practical living. Hawkstone is one of Regina’s newest neighbourhoods located in the northwest end of the city. This modern and practical community is conveniently situated close to every amenity. Step into a new world of cool metro styling and comfortable family living. Modern, attainable, smart – The Hawkstone lifestyle. 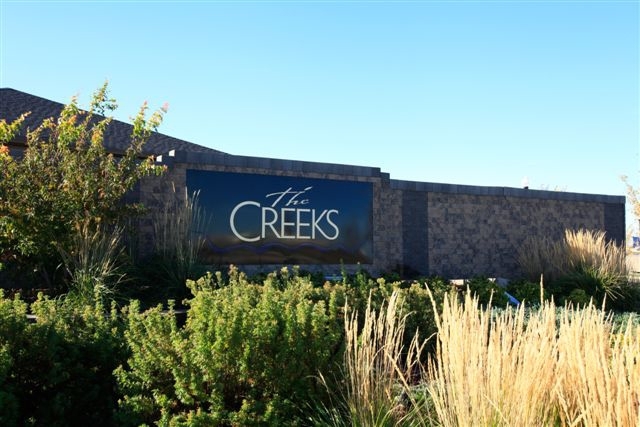 The most prestigious residential location in Regina: The Creeks. Imagine a beautiful new home on a spacious lot, a short distance from all the amenities of the city, yet with all the peace and quiet the countryside has to offer. That’s life in The Creeks. Located in north Regina. Kensington Greens is an architecturally styled development with featured park spaces, play areas for children and lit pedestrian walkways. Treed boulevards line the major entry points to this secure and friendly community. Your home will be built by some of Regina's most established and respected home builders, to high energy efficiency standards and features. Today Harbour Landing is home to just under 14,000 residents and spans 780 acres of land. Complete with a variety of retail, of ce space, parks, and walking paths Harbour Landing is a complete community with all the amenities you desire nestled right in your neighbourhood. The community has been built and designed with the environment, your home, and your family in mind. Throughout the process the landscaping, infrastructure, and green space has been planned to create a sustainable neighbourhood for you to put down roots. Campbell Close is an infill development tucked within the Rosemont subdivision. Rosemont is a proud neighbourhood with excellent schools, parks and athletics. A fantastic neighbourhood to call your home and raise a family. Rosemont was developed between 1946 and 1980, the neighbourhood consists primarily of single family homes. It includes 13 parks / green spaces including the A.E. Wilson Park walkway and Rick Hansen Park, which has been recognized for its accessible design. The Rosemont Shopping centre on 4th Avenue is a close hub for shopping and services.